At the end of March we spent three days at Disneyland. It was tons of fun, and Ava had a blast. We had early admission (7 a.m.) the first morning. So, we got there at 6:45 (5:45 Utah time) to wait in line. Here's Ava having her breakfast while waiting to enter the park. 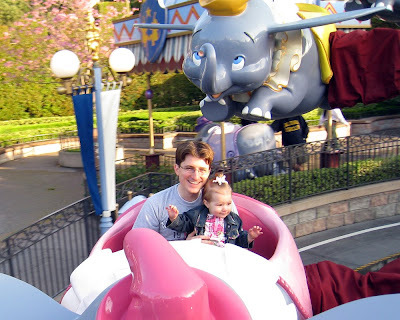 The first ride we got on was Dumbo the Flying Elephant. Ava loved it. She especially liked using the lever to make Dumbo go up and down. We continued on to several other rides in Fantasyland. Here's Ava in line for Mr. Toad's Wild Ride. 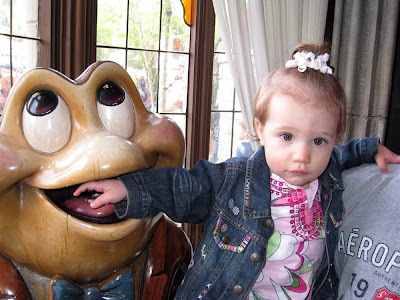 At Larry's prompting, we got her to put her hand in Mr. Toad's mouth, although she was a little uncertain. Then we went on the Mad Tea Party. Ava was dancing to the music while we waited in line. 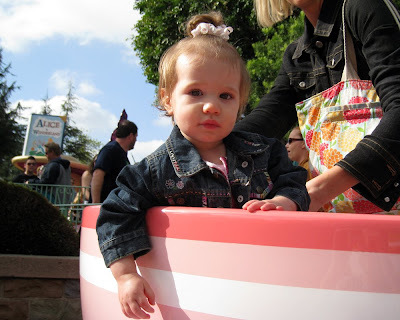 Once on the ride, she thought it was really fun to spin in the teacups. Mom and dad—not so much. 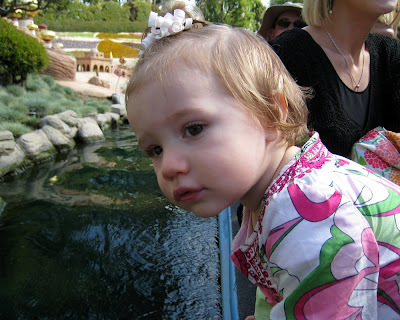 Later that morning, we went on what was probably Ava's favorite ride of the day—the Storybook Land Canal Boats. Ava loved seeing all the ducks and scenery. 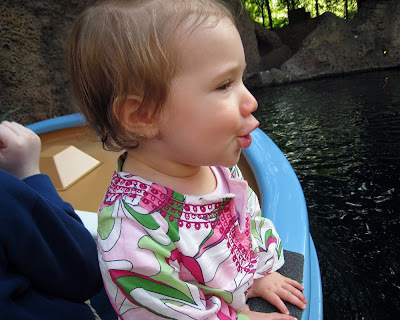 However, we were too nervous that she was going to jump overboard into the water to really enjoy the ride. 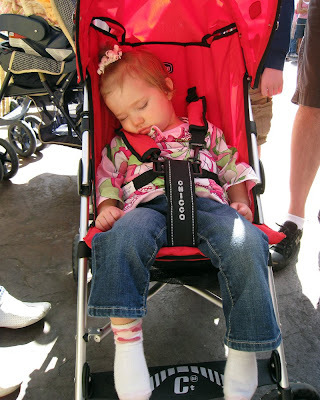 By the time that ride was over, Ava was tuckered out and ready for an afternoon nap in her umbrella stroller. While Ava was snoozing, we all met up with the rest of Krista's family over at Frontierland to see a western show. Little did we know the treat we were in for. The entertainment was a bluegrass band called Billy Hill and the Hillbillies. Billy, who looked just like Ernest, took a liking to Krista and pulled her from out of the crowd up onto the stage to play the fiddle with the rest of the band. 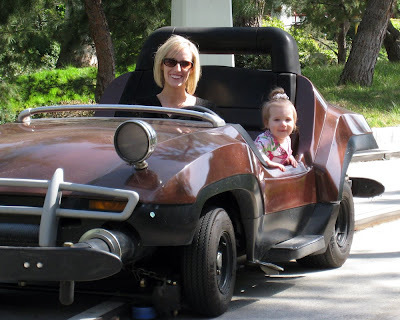 After Krista's stellar performance and a visit to the Enchanted Tiki Room, we all headed over to Tomorrowland to ride on the Autopia cars. Ava thoroughly enjoyed herself and liked turning the wheel. Afterwards, Ava's six-year-old cousin Luke (who was in the car behind Krista and Ava) asked why they were going so slow. 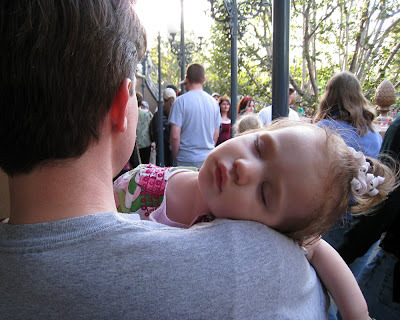 As the afternoon turned into evening, Ava fell asleep on Larry's shoulders (something she never does) while we were waiting in line to get on Pirates of the Carribean. Remarkably, she slept through the entire ride—splashing water, gunshots, loud music, cannonball blasts, and all. So we decided to call it a day. Well it's about time you guys put some new pics on here!! I didn't know you went to Disneyland...how fun!!! You guys have had LOTS of fun vacations lately!! Ava is adorable as always...and sure does look pooped out!!! Fun! Looks like Krista had a better time than Ava!